If you want to know if there’s a loft in a building (be it a barn, house or condo), just follow a kid. 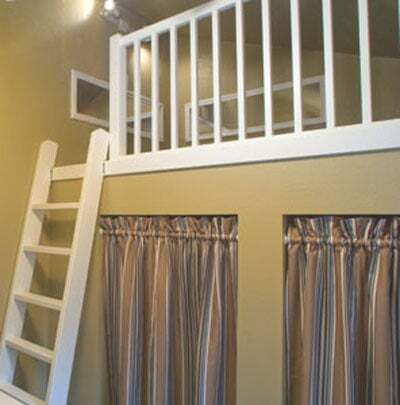 Kids just love loft areas, which is all the more reason to make them safe. Lofts can be very cool design features that add interest to interiors and take advantage of otherwise wasted space. A loft is often created where you have a structure within a structure, the most common being a large open room with a vaulted ceiling adjacent to an interior space that has a lower flat ceiling, which creates the floor for the loft. 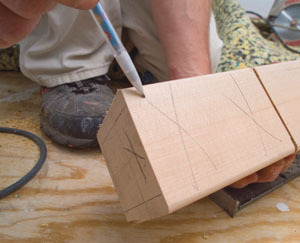 Determine the location of the floor opening for the newel post tenon. 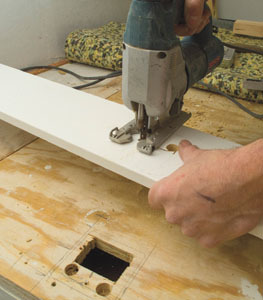 Drill the corners with a spade bit and cut out the floor boards with a jigsaw. Determine the location of the newel post, trace the outside of the newel and mark where the rim joist should be. Any time you have elevated floor space to an open area below, you need to have either a half-wall or a guardrail for fall protection. A project we worked on recently made clever use of extra space in a deep garage by carving out a room. This included a loft space where the floor of the loft was built partially over the room’s closet and partly into the garage area, allowing the front end of a car to fit underneath the loft floor. Determine where to cut the height of the newel post by starting at the point where the top of the guardrails will intersect the newel post and from there, measuring down 37 inches, determine the guardrail height without the carpet. And to that, add the length of newel post that will extend below the floor into the floor joist framing system. 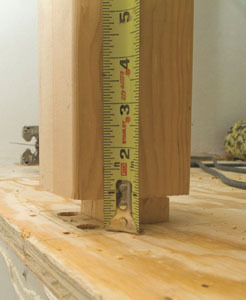 Measure how much newel post will be able to sink below the floor. As is often the case with a loft, the guardrail presents a challenge where the rail height is interrupted by the rake of the ceiling coming down to meet it. You may also run into the challenge, as we did, of finding a way to anchor the rail into a ceiling where there are no rafters lining up with the rail. We’ll cover the most important components of building a guardrail (anchoring the newel post, setting the rail height, anchoring the rail, and setting baluster spacing). In addition, I want you to see how we added backing behind the drywall and how we continued the rail down the rake of the ceiling so the balusters could be securely anchored to the top and bottom. 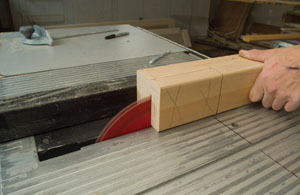 A table saw outfitted with a sliding bevel guide was used to cut a kerf all the way around the newel post at the elevation where the trim board meets the newel post. 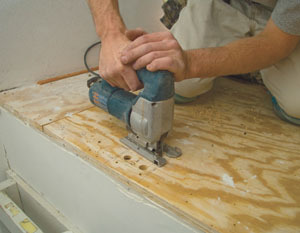 A miter saw is used to cut the newel post to length. After you have determined the location of your newel post, you need to think about the best way to get it firmly anchored into the framing of your particular project. Very often in a loft situation, the newel post will be anchored on top of, or very near to, the rim joist that supports the open front of the loft area. It was the rim joist that was the target framing member to which we wanted to anchor our newel post. 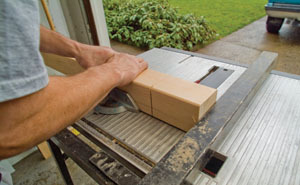 Any time you do a crosscut operation on the table saw; make sure to use the miter gauge. Usually you will have a little leeway in setting the newel post. 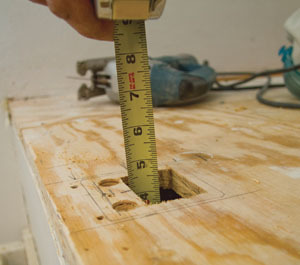 Check the floor fasteners to tell which direction the floor joists run, whether the floor joists of the loft area run perpendicular to a rim joist on the front, or if the rim joist at the opening of the loft area is the last in a series of parallel floor joists. In any case, try to set your newel post in such a way that it is next to, but not directly on top of, a floor joist that runs perpendicular to the rim joist. In other words, you are looking for some open space underneath the floor boards where there is no framing member. However, you want to set the newel post at a distance away from the outside of the opening so there is enough newel post penetrating down through the floor boards that can be anchored into the rim joist. Position the newel post over the hole to mark the size of the tenon on the bottom of the post. We usually try to set the newel post as close as we can to the open front of the loft. Keep in mind the thickness of the drywall that covers up the side of the rim joist. You can cut some of the newel post away so part of it penetrates down through the floor. We also cut a shoulder all the way around the newel post, which gave the bottom of the newel post a tenon that went into the opening in the floor. We usually mark the portions of material that we want to remove with an “X”. 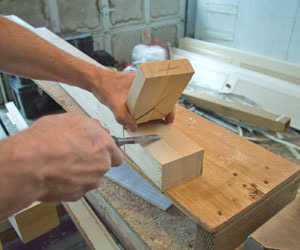 Extend the layout lines for the newel tenon across the bottom of the post and up to the shoulder cut. Once we determined the size of the tenon, we marked out a rectangular opening to be cut into the floor boards. We then drilled each corner for the hole in the floor with a spade bit and cut out the hole with a jigsaw. After we had the opening in the floor, we made sure that there were no wires or pipes or anything interfering. We then removed the insulation and measured how much newel post we could put below the floor. We also added to this amount the thickness of the trim board we wanted to put along the front of the loft to both support the shoe rail and to give the carpeting in the loft area a place to terminate. To this number, we added the height of our rail. 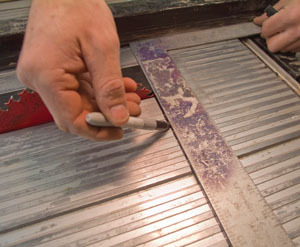 Mark a line on the table saw where the blade disappears below the surface. This helps to keep from cutting into the exposed portion of the newel post. We also considered how much reveal was needed to the top of the newel post from the top of the rail. In some cases, you will have an ornamental newel post and you need to determine the point where you want the top of the rail to tie in to the newel post. 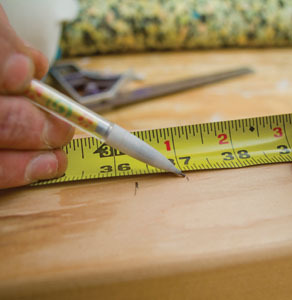 Go from there to the height of your rail—usually 37 inches for residential applications—which allows one inch for carpet and pad, and puts your rail height at 36 inches. 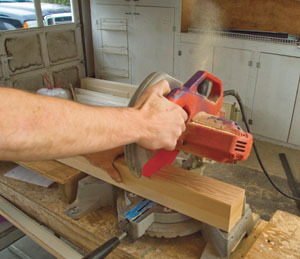 A 10-inch miter saw was used to carefully extend the horizontal shoulder cuts down to the vertical tenon cuts. 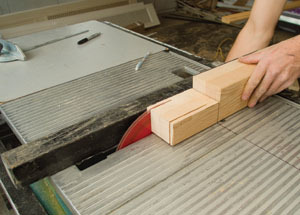 Use the table saw fence to determine the side-to-side location, and use the line on the table saw surface to determine the length of the cuts. After we cut the newel post to length, we marked where we wanted to make the shoulder cut of the tenon that would extend below the floor. We then used a table saw with the blade set to cut approximately 3/8-inch deep and cut all the way around the newel. This first cut gave us the shoulder we wanted on the newel post to hide the opening in the top of the trim board. 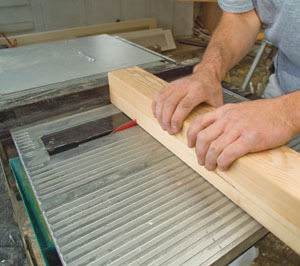 Use a wood chisel to snap the slabs off the side of the tenons and to finish cleaning up the cuts. We then positioned the newel post slightly off center over the opening in the floor and marked the width of the opening on to the newel post in both directions. Next, we used a Speed Square to extend these layout marks up to the shoulder cut on the newel and across the bottom of the post, to show where the material needed to be removed so the tenon could penetrate the floor. 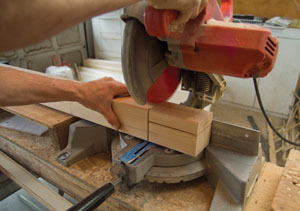 Repeat the process of using the table saw to remove extra material around the tenon; being careful each time to stop the cut at the mark on the table saw surface. We extended the table saw blade all the way up to the maximum cut depth and used a framing square to mark where the blade disappears below the deck of the table saw. We did this so that when we made the rips to take the extra material away from our tenon, we didn’t extend the saw kerf up into the above-floor-area of the newel post. With the newel post tenon now exposed, test its position. We made sure to allow room for the trim board that would be the base for the guardrail system. Next, we set the table saw fence to make the tenon cuts, being careful to stop each time the shoulder cut on the newel reached the edge-of-blade mark on the table saw surface. After making the vertical cuts for the newel tenon, a miter saw carefully extended our shoulder cuts down to meet the tenon. After cutting the trim board, which extends the length of the loft, we transferred the marks for, and cut out the opening for the newel post tenon. We used a wood chisel to pop the extra material off of the tenon and to clean up the areas that the saw blades couldn’t reach. These steps were repeated to remove the slabs off each side of the newel until only the desired tenon was left. We then checked that the newel would both fit in the hole and that the depth of penetration left the desired room for the trim board, which would go across the opening of the loft. 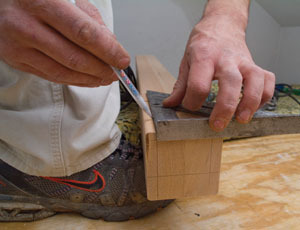 Note that the newel post tenon extends through the trim board and into the floor. The next step was to cut and fit the trim board that would create the border for the loft floor area, and make a hole that matched the hole in the subfloor. We put the trim board in place, leaving it loose, and tested the newel post to make sure it would go through both the trim board and subfloor. With the border trim board in place and the tenon cut on the newel, we positioned the newel post and fastened it by running screws through the rim joist and into the newel tenon. Once the post was securely anchored to the rim joist, we used cedar shims to tighten the border trim board up to the shoulder on the newel post. Cedar sims was used underneath the trim board to tighten it to the shoulder on the newel post. When anchoring the newel post through the rim joist and into the newel tenon, keep checking the post for plumb in both directions. We used a level to transfer the top-of-the-guardrail mark on the newel post over to where the guardrail would meet the rake of the ceiling. We also used a level in the plumb position to extend the location of the outside of the trim board up to the ceiling. This mark was used to determine the location of the center of the guardrail. A level held on the face of the loft floor projects the edge of the loft up to the ceiling. 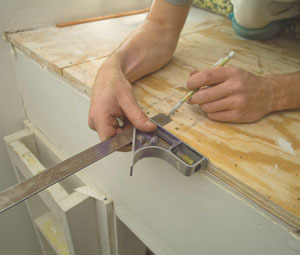 Use a level to transfer the top-of-guardrail mark on the newel post over to the point where the level section of the guardrail intersects the rake of the ceiling. After determining where the guardrail met the ceiling, we cut an opening in the ceiling drywall and inserted a backer board on top of the drywall. 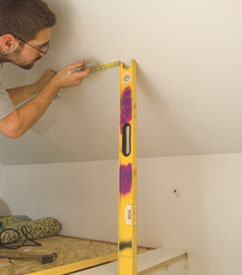 (If you are lucky, your handrail will already line up with a framing member inside the ceiling. But in our case, it was a void with only insulation behind it so we needed to put in a backer piece.) We used drywall screws to hold the backer in position above and below the opening we had cut in the ceiling. We then put the same piece of drywall that we had removed from the ceiling back into the opening and fastened it with drywall screws. Before moving on to the rail installation, we started the drywall patch, because this is easier to do with no rail to interfere. 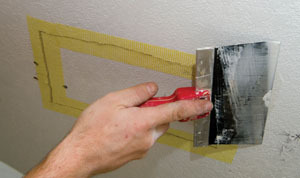 The drywall patch requires some seam tape and drywall compound applied with a drywall knife. We planned to apply the final texture and the paint touch-up after the rail was in place. 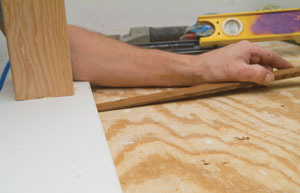 You can hold on to the backer board with one hand, while fastening it to the drywall with the other. 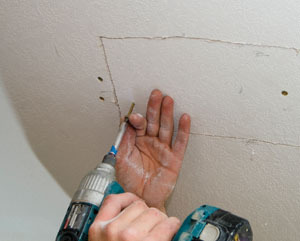 To install backing in drywall, we always cut a big enough access hole to maneuver the size of the backer board needed into position. Next, we installed the shoe rail, which was a fairly straightforward process of measuring the distance between the exterior wall and the newel post, cutting the rail, centering it on the newel post, and then matching the reveal on the trim board at the other end. We started the guardrail installation by measuring how much rail we would have in the level section between the newel post and where it met the ceiling—and how much rail we would need to cover the distance from the point where the guardrail met the ceiling down to where the rake of the ceiling met the vertical exterior wall. With these two dimensions in mind, we divided our rail up so there was extra length on each of those two pieces of guardrail. 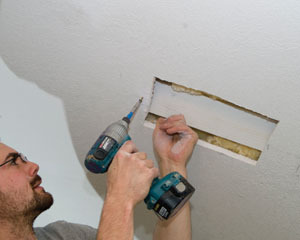 Once the backer board is anchored in place on both sides of the drywall opening, you can put the same piece of drywall back into position. We then took the section of guardrail that was going to fit along the rake of the ceiling out to the table saw where we cut off the top radius of the guardrail. We used a couple of scrap pieces of framing material and a torpedo level to test and adjust the angles where the level guardrail met the rake of the ceiling to get the correct angle cuts on the end of the rail. We also used a sliding T-bevel to match the angle where the vertical exterior wall met the rake of the ceiling, so we could cut the correct angle on that end of the now flat top-rail section. After cutting and checking the angle at the low end of the ceiling rake rail, we positioned and marked it where the top of the guardrail met the ceiling. 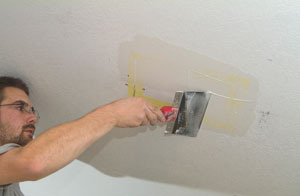 The drywall patch for the backing access hole should include seam tape and drywall joint compound. 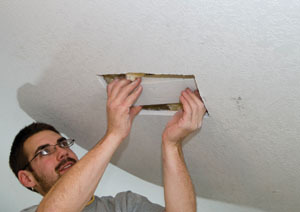 It’s a good idea to begin your drywall patch before fastening the guardrail to the ceiling. This is an easier process with the rail out of the way. We anchored the ceiling rake rail with long drywall screws up through the plow in the rail and into the backing piece in the ceiling on the upper end, and into the top plate of the exterior wall on the lower end. Left: We used a plowed shoe rail, which we installed from the newel post to the exterior wall. Right: For the section of guardrail which was fastened to the ceiling rake, we removed the top radius from the rail with the table saw. With the ceiling rake rail in position, we adjusted the level guardrail to it until the bottom profiles lined up and the angle was correct. Then we marked and cut the newel end of the guardrail and fastened it into position. Left: Use scrap material and a torpedo level to determine the angles where the level guardrail meets the rake guardrail. 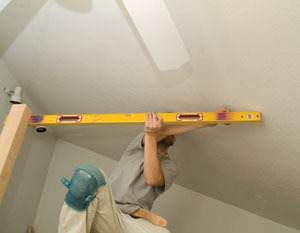 Right: A sliding T-bevel can determine the angle where the exterior wall meets the ceiling rake. With the newel post firmly anchored and the guardrail installed, we measured from the bottom of the plow in the shoe rail to the bottom of the plow in the guardrail to determine our full baluster heights. Baluster layouts for this project were pretty simple because we wanted to have a maximum of 4-inch spacing between the balusters. 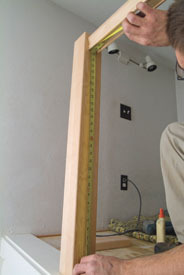 The balusters were all square so we knew that our fillets would be about 3-7/8 inches. It didn’t really matter what the last space was to the exterior wall at the short section of the rail, because visually that portion of the rail was so different. This gave us some freedom to begin the baluster layouts from the newel post, working toward the exterior wall. It was easy to determine the approximate number of full-height balusters we would need, so we set a stop at the miter saw and cut multiples. Left: We anchored the ceiling rake section of guardrail to our newly installed backer board by runnin drywall screws up through the plowed section of the guardrail. 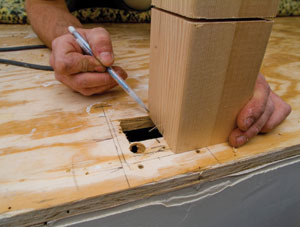 Right: Use carpenter’s glue at all of the joints. We also cut multiple fillets, being careful to check the first baluster next to the newel post to make sure it was plumb (theoretically, it should be if your newel post is plumb). We then installed the balusters by first gluing and nailing in an upper and lower fillet, then gluing and nailing in a baluster against the fillets and repeating the process until the level section of the guardrail was done. With the guardrail fastened to the newel post, we measured from the inside of the plow at the base rail to the inside of the plow on the guardrail to determine the baluster heights. To complete the rake section of the rail, we continued to put the square cut fillets in the bottom plow and positioned the balusters in those bottom fillets, which were a little extra long. We extended them up past the ceiling rake section of rail and moved the baluster into a plumb position using a level. We could then trace the side of the rail onto the baluster, cut it, try it and fit it until it was the right length to be in position and plumb. Left: Save time cutting the balusters for the level section of the guardrail by setting a stop on the miter saw wing boards. Right: During the process of setting the balusters, it’s important to check every 3rd or 4th baluster to make sure that everything is staying plumb. At each of these rake sections we glued and nailed the balusters but left the fillets out at the top. Then, we positioned the fillets and marked and cut them at the angle we had determined earlier. We finished the rail system by gluing and nailing the top fillets into position. Left: When we were starting our baluster layouts, we decided that the spacing between the final baluster and the exterior wall was not that important, as long as it was not larger than the code maximum of 4 inches. Right: To make the baluster cuts on the rake section, we continued to use the same size square cut fillets in the shoe rail while standing the balusters in position and making them at the guardrail. The homeowners wanted a paint-grade rail system, so the painters caulked all of the connections between the fillets and the shoe rail, the fillets and the handrail, and where the rails met the newel posts. We did some masking around the guardrail where the rail system met the ceiling so we could retexture the drywall patch where we put our backing board inside the ceiling. The finished guardrail helps to make a fun and safe play area for the kids. When it was all done, it was a cool looking guardrail that matched the décor of the house. It is currently helping to keep the loft-seeking kids that live there safer. Sometimes it’s impossible to find a newel post location that is not completely filled up by floor framing. 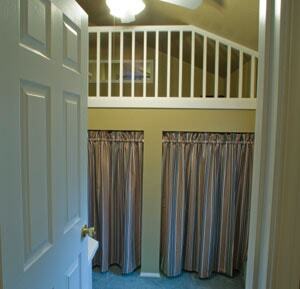 In this case, you’ll need to use a different type of newel fastening system. While there are several on the market, my favorite is the Sure-Tite Fastener by L.J. 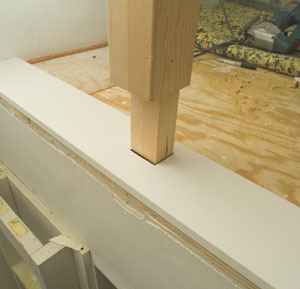 Smith (www.ljsmith.net), which employs a large lag bolt that screws down into the floor framing and extends up inside the newel post. The 10-3/4-inch lag bolt has wood threads on the bottom and bolt threads on top. 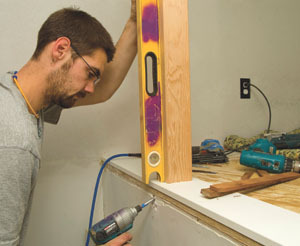 The installer must cut a 1-1/2-inch hole through the side of the newel to access the top of the bolt where a special washer and standard nut can be tightened with a wrench. A tapered wood plug, which comes with the kit, fills the access hole. While it’s preferable to drop a newel into a joist bay, this is the next best bet for a flat-on-the-floor installation. Other situations (at a landing, on the end of a knee wall, on a rake wall) require different methods. Just make sure you get the post very solidly installed.